It's often said that a shoemaker can't mend his own shoes or a hairdresser can't style her own hair. One might be tempted to look at Diane Pomerantz's difficulty in understanding and analyzing the narcissistic, mentally abusive husband she reveals to us in her memoir, Lost in the Reflecting Pool, in the same way: Pomerantz is, after all, a psychologist, and a very good one. Then how come it takes her so long to stand up to Charles and eventually remove herself from his debilitating control over her thinking and self-esteem? Diane's story is, sadly, the story of far too many women who fall in love with a man and ignore the early warning signs that he might just be a bad choice as a life partner. Charles woos her with flowers, says all the right things, and when he says or does the wrong thing, she dismisses it, thinking the problem is her and not him. 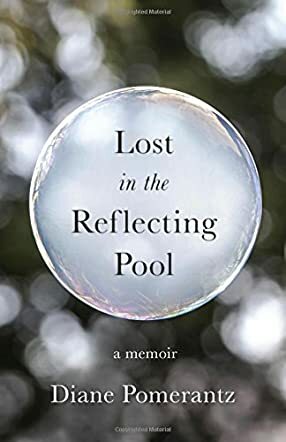 If ever there was a story that proves how blinding it can be to fall hopelessly in love, Lost in the Reflecting Pool is that story. In the early years of their marriage, Charles, a psychiatrist, chooses where they go, what activities they engage in, and what houses they should buy. Even when Diane doesn't like his choices, she convinces herself she does like them. And then, suddenly, Diane learns she has cancer. Is the loving Charles by her side, worrying with her as a good husband should? No. He's too busy with his patient load. Diane goes through a medical nightmare for years and when it is recommended that she have stem cell surgery, Charles goes as far as to suggest that, given their financial difficulties, she should just accept her fate! What kind of cold-hearted human being is this? You have to read Lost in the Reflecting Pool to get the full picture of the suffering Diane Pomerantz endured medically and mentally through the many years of her marriage to Charles. It's a heart-breaking read, but Pomerantz eases the tension with endearing stories of time spent with her children, who sadly also suffer under a father like Charles. It's a relief to read this realization that Diane reaches at the end of the book: “I no longer feel compelled to know the “whys” of what Charles did. With that understanding has come a great deal of freedom. Letting go of the need to have answers to unanswerable questions—accepting that there were things that were, that are, and that will always be beyond my control—has allowed me the freedom to move on, to find myself once again.” That is superb advice from one who knows for all women who survive a bad marriage like Diane's. Highly recommended reading.